I am fortunate that my kids eat virtually anything. It is however sometimes difficult to get my daughter to eat enough vegetables. One sure way is to make what we call winter chili. It is a combination of vegetables, beans, lean ground beef and lean ground turkey that cooks all day in the crock pot. It is filling and savory with just a bit of spice. It has a ton of ingredients, but it is really super easy to make. As a treat I serve it in a sourdough bread bowl with a touch of cheese and a spoonful of non fat Greek yogurt and green onions. Brown ground beef and turkey in a large saucepan. Drain all but 2 tablespoons of the fat. If there is not enough add a touch of olive oil to pan. Add the garlic and onion, cook and stir until tender. 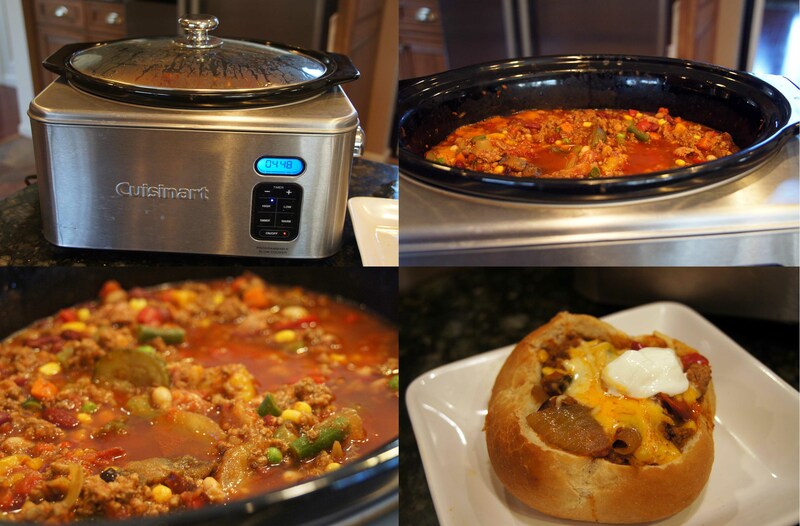 Place all ingredients in slow cooker, mix well, cover and cook on low for 8 hours. I love the idea of the bread bowl. I made chili tonight, too! I will have to try the bread bowl next time we have it. My kids love it that way! i have always heard of chili, never tried it or rather don’t know much about it.. Is it like a soup?. Chili is so wonderful! It is thicker than a soup and full of flavor. It is closer to a stew, because while there is some liquid the other contents really make the dish. This is just one type of chili! Lol poor Josh. You know …I never eat the bread! Just thought about it.